Here are Philhealth coverage amounts for Chemotherapy. Chemotherapy is the use of chemicals or medications to kill cancer cells. Most chemotherapy is delivered intravenously. a. The case rate amount for chemotherapy is equivalent to one cycle of chemotherapy. b. One cycle of chemotherapy is equivalent to 2 days deduction from the 45 days benefit allowance. c. Chemotherapy may be claimed as inpatient or outpatient. i. If claimed as inpatient and in the same hospital, the chemotherapy package may be claimed as first or second case rate. ii. Multiple cycles may be claimed in one claim form for both inpatient and outpatient chemotherapy. The dates of each cycle claimed shall be indicated in the space provided in Claim Form 2. Good AM. Sir/Ma’am, ask lang po ako alin po dito yung babayaran ang case po ay chemo for breast cancer? May mga packages po ba? Hi flora mae, if the breast cancer is newly diagnosed and the patient has not yet undergone chemo, find a hospital that can help you apply to Philhealth under the Z package (if approved, total cost of treatment is 100k). Is hormone therapy covered by Philhealth? I am taking tamoxifen for breast cancer. Hi Alexandria, if this is early stage, ask Philhealth about the Z package for breast cancer. If it’s breast or cervical cancer, ask your family to ask Philhealth about the Z package for breast or cervical cancer. Hi Philip, sad to say, what I know is that outpatient diagnostic procedures are not covered. Since this is a new diagnosis, you can ask Philhealth about how to apply for their Z program for breast cancer, so you can get better coverage. Hi Minda, sorry, the Z package covers only breast cancer stages 0 to III-A. The regular chemo is covered, as outpatient or confined. http://www.healthphilippines.net/2014/03/philhealth-coverage-for-chemotherapy/ If truly needed, they can ask for assistance at PCSO. Many people lining up at PCSO are not indigent; PCSO knows that even people with high incomes can be devastated by hospitalization costs. Hi Ali, the coverage for regular chemo is 7,280 (5,600 pesos for hospital expense and 1,680 for PF). Ask the hospital about cost. If you have chemo prescription and medical papers, you can ask PCSO for assistance for meds. Your hospital’s social welfare can help you with papers. Hi This is Janice, I would like to ask what are the coverage that philhealth can provide us, my mother got breast cancer stage III-B. Prior to her operation she was advised that chemo therapy is needed, as well as after the surgery. We will be spending a lot of money which includes laboratories. Professional Fees, Inpatient accommodation etc. Now we need to know how to lessen the expenses to make sure that we can support her until such time that she is all clear. Hi Janice, sad to say that Philhealth’s special 100k package for breast cancer is for early-stage-cancer patients only. But you should ask your hospital if you can avail of this package. If not, the regular chemo administration coverage is 7280 pesos per session. Coverage for mastectomy is 22k per breast. If 2 breasts in one surgery, coverage is 33k. If separate operations, 22k per operation. Philhealth gave an example in its website of chemo of 2 cycles plus radiotherapy (LINAC) of 2 sessions — the coverage is 20,560. Talk to the hospital about costs so you’ll be prepared. hello, I have bone tumor and my doctor advised me to undergo denosumab xgeva. I take medication monthly by injection; the cost of the injection is 20,250 per vial a month. I’m a philheath member since april 2014. What can philhealth do for my case. thanks. good day! Ni nherlyn, for the main coverage, you can explore this search program: https://crs.philhealth.gov.ph/ To supplement any Philhealth benefit for your meds, you can also ask help from PCSO with these documents: http://www.healthphilippines.net/2015/01/pcso-medical-assistance-for-hemodialysis/ This post is for dialysis patients, but you can use it as basis. Hi elean, go to the nearest Philhealth with your mother’s medical papers, ID and your father’s Philhealth no. and your father’s authorization to process Philhealth papers and ask about applying for Z Benefit Package for Cervical Cancer. My husband has stage 3b rectal cancer. He had surgery nov 8, 2014 and stayed inthe hospital for 8 days then he had radiotherapy (RT) for 25 days. We were able to claim for philhealth for these. He needs 6 cycles intravenous and oral chemotherapy starting feb 23 and he will be confined overnight. The next 5 will be done outpatient. We were told we will buy the medicines from the doctor. 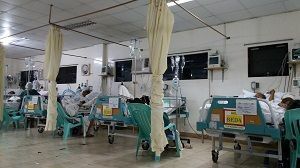 Can we file for philhealth benefits even for outpatient service? Hi grace, yes, chemotherapy administration is covered, even if done as outpatient, but ask the hospital so that the chemo benefit is deducted from the bill. Hi Alleya, yes, she can use her Philhealth beginning this March. Good day. Ask ko lang mam kc at this time ang minimum days na pag stay ko sa hospital ay 6 days, naeextend pa po kapag sinalinan ako ng dugo, same po ba ang maavail ko sa chemotheraphy benifits. Ang concern ko po ung no. of days kada chemo kasi minimum of 6 days po ako at ang ibinibigay sa akin ay for 1 chemo benifits lang 6 days or more din po ba ang ibabawas sa akin sa 45 days na ibinibigay ng philhealth per year. Salamat po and more power. Hi po. Who are qualified to avail the Z package? ex.if suffering from colon cancer stage111. Can all paying members avail or only indigent? Can the Z package used in a private hospital? Hi Jam, yes, every member can avail as long as the cancer is newly diagnosed. Cannot be used in any hospital. Must be in a contracted hospital. No list yet for colon cancer, but I’ll email you a list of hospitals for other Z packages. You can ask these hospitals if they’re offering Z benefit for colon cancer. Can you send me details of the Package Z for Colon cancer stage 3? Hi Jason, I’ve emailed you files. Hi maricel, yes, Philhealth covers part of the chemotherapy cost per cycle. Hi Ms. Nora. Tanong ko lng. Diagnosed po ang mother ko ng Cervix cancer and required po ng radiation therapy and chemo therapy. pero nagamit na po namin phil health namin nung surgery po ng mother ko sa PGH. tanong ko lng po kung nauubos po ba ang laman ng phil health at kung mggmt pa ba namin un sa chemo and radiation nya? thanks po. Hi Jason, 45 days ang allotment per member per calendar year. If she spent 4 or 5 days in the hospital, she still has 40 days left for 2016. Puede pang gamitin for radiotherapy and chemotherapy (1 cycle of radiotherapy = 1 day; 1 cycle of chemotherapy = 2 days). Exempted from the 90-day-same-treatment rule ang chemo at radio, so puede siyang sunud-sunod. Bali ibig sbhn po pag naubos ko na ung 45 days, magbabayad na po ako ng cash na wlng discount from phil health? Hi Jason, yes, pag naubos na ang 45 days, cash na. Mag-umpisa uli ang new allocation of 45 days sa year Jan 2017. Puede kang mag-apply for assistance from PCSO or the Office of the Vice President. Research mo na lang mga required docs online, pati mga suggestions. Thanks Ms. Nora, Madami ka pa po sana matulungan sa mga katulad kong may mga katanungan. Godbless! gud eve p.my father was diagnosed with stge3b colon cancer he is a member of philhealth since he’an ofw and regularly contributing to the institution.what help can philhealth provide him for his chemo treatment via iv? Hi yojann, is your father’s cancer newly diagnosed? If newly diagnosed, he can avail of the Z benefit package. It is offered at the UP-PGH. The Z benefit package for colon cancer is a full treatment package but he must first be seen by a doctor there. When you get there, ask for the cancer department and ask about Z benefit package. Hi Ms. Nora, My dad was diagnosed last July 31, 2016 of colon cancer stage 4. May I know if covered siya ng Z Package of philhealth? If you can refer me to a link maam much appreciated. Mahal po kasi now ng gastusin. Besides PCSO maam, ano po kayang organizations that can help with our cost? Thank you Ms. Nora hulog ka po ng langit for helping so many of us in our questions. Hi boy, it’s sad that the Z package covers colon cancer only up to Stage 3. Here are links: Colon Cancer FAQs at UP-PGH. Isang hospital pa lang (UP-PGH) ang nabasa kong contracted for colon cancer Z package. Pero kahit stage 3 na, puede pa namang magpunta sa UP-PGH to ask. Puede kayong lumapit sa mga offices doon sa Senate and Congress, at Vice President at sa Malacanang. Puede rin sa offices sa mismong munisipyo nio (councillors, mayor, vice mayor). Bring medical documents and receipts, photos of your father, your IDs and your birth cert (to prove relationship with your father). Thanks for appreciating my blog. Means a lot. Keep praying for strength. You’re a good son — you’ll be blessed. I’ll get back to you halimbawa lang I see a foundation helping colon cancer patients. Hi Tin, pay ASAP for July to Sep (600 pesos) so you can use it this September for colonoscopy. Find a Philhealth-accredited doctor and hospital. God bless too. Hi Jhaz, kapag breast cancer or colon cancer, and newly diagnosed as cancer, ask your doctor if your mother qualifies for Philhealth Z benefit. This benefit has bigger coverage. Hi John, puede siyang maconsider kapag i-accept ng Philhealth na ang condition siya is permanent disability. Dapat mapa-register mo as your dependent before discharge. Bring a “detailed Medical Certificate issued by attending physician stating the diagnosis, extent of disability and the date when the disability was acquired.” Puede kayong mag-ask ng assistance sa social services dept ng hospital so you can ask help from PCSO. Pag PCSO, dapat hindi pa paid yong bill or konti pa lang ang nabayaran. Hi,po.Ask ko lng po kc 1mo post mastectomy ako at sa wed po 1st chemo ko dhil sa invasive ductal carcinoma.sa ust hosp po.pwede po b dun ung z package o ibbawas lng ung philhealth?mgkno po ang mddiscount ko? Good day sir/mam. Ang father ko po ay non hodgkin’s lymphoma patient. He is 71 yrs old. So obviously hindi na po sya nag work. Lahat po ba ng chemo sessions niya ay covered sa philhealth? Hi Cristina, sorry hindi. Merong allocation na 45 days per Philhealth member per year. One cycle of chemotherapy is equivalent to 2 days deduction from the 45 days benefit allowance. Puede kayong lumapit sa PCSO for the other chemotherapies. Hi rose eden, younger than 21 ba siya? Iregister mo siya as your dependent sa Philhealth. Bring his/her birth cert. Kung older than 21 na, ikuha mo na siya ng sariling Philhealth. Yes, covered ang chemo. Find a hospital na Philhealth-accredited then magtanong about chemo with Philhealth coverage. Hi Mitch, sorry hindi ko sure kung considered chemotherapy yan, at kung chemotherapy, this procedure is done and covered by Philhealth as outpatient. Ang admission naman is decided by your doctor after examining you. Hi Larissa, sorry ngayon lang ako naka-reply. I hope nakapagtanong na kayo sa iba. Depende sa doctor at hospital kung kasya yong Philhealth coverage sa chemotherapy bill. Yes, 45 days ang allotment per patient per year. One chemo session is counted as one day. Halimbawa lang hindi pa kayo nakahingi ng assistance, if you like, basahin mo itong PCSO assistance procedure and documents required. God bless you too.